The platypus, often referred to as the duck-billed platypus, is a one-of-a-kind mammal. Similar in some ways to birds and in other ways to reptiles, the platypus, a native of Australia, is a kind of "hybrid" and is a member of the rare "monotreme" order of mammals -- an order with only one other member, the equally unusual echidna. Henry Fountain remarked in a 2008 New York Times article that the platypus "tops many people's oddest mammal list," and this is for good reason. The platypus is a semi-aquatic creature with a duck-like bill, a beaver-like tail, a body covered in waterproof fur, webbed feet that sport claws, and a venom-ejecting "horny spur" on its ankles. Add to these features the ability to lay eggs, secrete milk through abdominal skin and walk like a reptile and you have an animal that is quite incredible indeed. As an egg-laying mammal, the platypus is placed in a special order of mammals, referred to as the "monotremes." There is only one other mammal that fits this category: the echidna, another hybrid that is native to the Australian continent. Accordingly, while the platypus shares some physical features with birds, beavers and reptiles, the only animal that can be considered a relative of the platypus is the echidna. As the Tree of Life Web Project reports, there are two types of echidna -- the long-beaked and the short-beaked. Like the platypus, the echidna in some ways looks like a make-believe animal, with a leathery bill that does not seem to match its body. 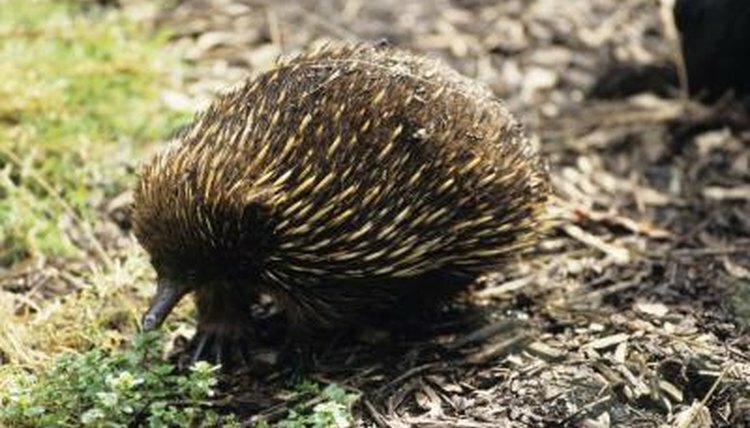 As monotremes, echidnas also are egg-laying mammals. The resemblance to platypuses, though, is limited. Echidnas have bodies that are covered in spines and have an appearance that seems closer to that of the anteater. In fact, echidnas frequently are referred to as spiny anteaters. According to scientific studies, reported in the New York Times in 2008, monotremes split from other mammals more than 160 million years ago and may be viewed as "link" animals -- animals, in other words, whose evolution from bird to mammal took a different turn, resulting in a permanent evolutionary intersection. Furthermore, platypuses and echidnas had their own evolutionary split more than 120 million years ago, resulting in two different but related species. No other member of the animal kingdom, however, may be considered a relative of either the platypus or the echidna.